Sonic Attack is an Amiga music collection produced by demo group Dual Crew & Shining. It spans four disks, and Sonic is prominently featured in the collection's artwork. Disks 1-3 are filled primarily with demo content, showing off various features of the Amiga hardware; however, disk 4 has a limited recreation of Green Hill Zone, with completely custom graphics and music, which is somewhat playable. 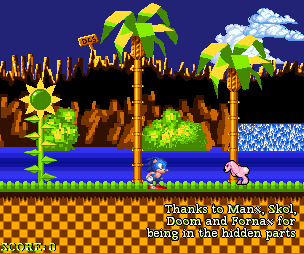 The level is endless, and Sonic can only run to the right and jump (though there are no jumping animations). There are also several "enemies" which can be killed by jumping on them. Likewise Sonic can also be "killed" if he runs into one.